Pop some champagne and kiss those Sunday scaries goodbye. Going out for brunch each weekend is delicious and fun, but it can really put a dent in your bank account after a while. Does that mean we should give it up? Absolutely not. Pick up these products from Walmart and start hosting bomb brunches in your own home to save some cash moneyyyy. 1. A table runner that is both affordable and perfect for gussying up your standard table for a classy brunch. Transform your boring table into something a bit more....adult(?) by adding this chevron, knit table runner. It fits between four and eight people, which should be more than enough to hold your Sunday funday squad. 2. A 19-piece kitchen utensil and gadget set to make you smile while you're stressing out over how long to bake your breakfast casserole for. Get it from BuzzFeed's Tasty collection at Walmart for $14.88. 3. A bamboo charcuterie platter that will let you show off your cheese-plating ~skillz~. Ugh. Just thinking about a fancy cheese plate makes my mouth water. Make your guests have that same reaction the next time you host brunch by putting together a spectacular arrangement of snacks on this charcuterie platter. It comes with a built-in wedge to hold the cheese knives and spreaders, along with seven pieces of cutlery and a ceramic dish. 4. An electric wine bottle opener, because no one should have to wait for a glass of pinot at brunch. Turn your basic brunch into a boozy one in a flash with a little help from this electric wine opener! It can open up to 30 bottles on a single charge and has a foil cutter in the back to easily remove seals. Get it from Walmart for $16.49. 5. 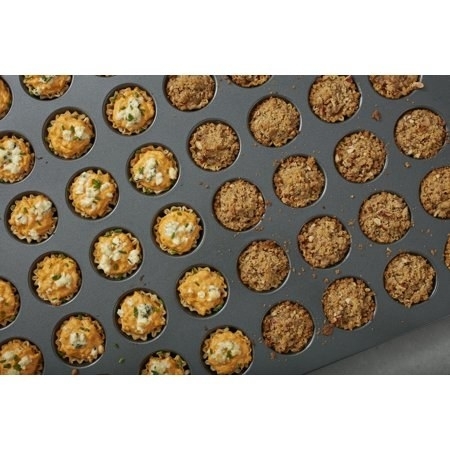 A nonstick mini muffin pan so you can treat your guests to an abundance of homemade baked goods — or mini quiches! One of my favorite things to make in a muffin pan are bite-sized quiches, but they are forever getting stuck in the tin! I was so tired of scraping and scrubbing, so I invested in a nonstick pan. You can do the same and whip up these treats for a brunch with your friends in no time. These stoneware plates feature a delicate lace pattern around the edges and they make me want to squeal. The set includes dinner plates, salad plates, and bowls — so you'll be more than ready to host a charming brunch! Get it from Walmart for $34.88 (available in six colors). 7. A set of personalized slate coasters, because you deserve the finer things in life. IMHO, brunch should be a classy affair filled with sweet treats and delightful drinks. Add a touch of personality to your kitchen decor with these personalized coasters — your guests will notice the extra effort you've made. Get a set of four from Walmart for $25. 8. An 11-piece nonstick cookware set to replace your scratched, beat-up pots and pans. If you've already volunteered to have everyone over for brunch, you deserve a reward! Treat yourself in the form of new pots and pans. This set comes in stylish colors that will brighten up any kitchen and includes a number of features that make it worth the purchase. The cookware has a nonstick diamond reinforced coating, heavy-gauge forged aluminum for optimum heat distribution, and silicone handles and knobs (just to name a few). Get it from BuzzFeed's Tasty collection at Walmart for $79 (available in four colors). 9. A coffee maker that will ensure your friends are happily caffeinated while they're feasting. If you're going to do this whole brunch thing, you might as well do it right! You can't have a morning meal without a splash of caffeine. 10. A set of elegant mugs, because if you're serving coffee it might as well be in a nice cup! Get your caffeine fix, but make it cute. This set of stoneware coffee mugs features pretty detailing along the edges and can be tossed in the dishwasher once your guests leave. Get it from Walmart for $9.99 (available in three colors). 11. A 5-quart Dutch oven to make brunch recipes Ina Garten would praise you for. If you've already bought the pots and pants, you might as well add this Dutch oven to complete the set! You can easily whip up a big portion for your friends and family in this bad boy. 12. A stunning floral pie plate that will turn your basic broccoli quiche into a beautiful brunch offering. Whether you use this pie dish for a traditional breakfast quiche or choose to serve up something sweeter, you and your guests can stop to admire the delicate floral pattern as you chow down. 13. A 3-gallon beverage dispenser, so you'll never run out of your favorite spritzer. Mimosas? Bellinis? Bloody Marys? All the best drinks are served at brunch! Instead of paying an arm and a leg at your usual watering hole, make a big batch of your fave beverage and let your guests help themselves from this easy-to-use dispenser. It even features a separate section in the core of it to store ice and keep drinks cool without watering them down. 14. A three-tier serving tray that will make your guests feel like they're at an elegant tea party. Have you ever been to a fancy lil' tea house where they serve bite-sized treats? I can't get enough of those dainty delights — and your guests won't be able to either. And honestly, who could resist a fancy tea cake served up on a pretty tray like this?! Get it from Walmart for $24.88. 15. A set of glass mixing bowls, so you can bake up something sweet or whisk a ton of eggs at once. If you don't already own mixing bowls, why are you hosting brunch!? At this point that's neither here nor there, just make sure you pick up this lovely glass set so you can get cooking! 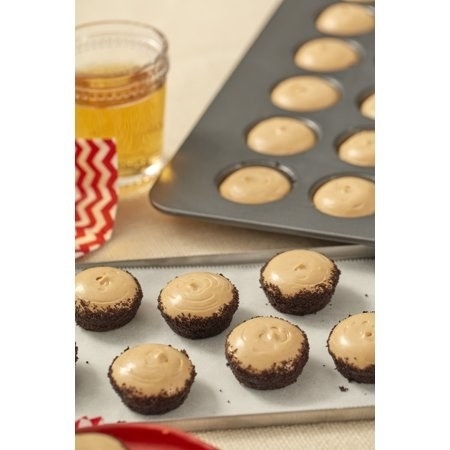 They are stackable as well as microwave, freezer, and dishwasher safe. Get it from BuzzFeed's Tasty collection at Walmart for $17.44. 16. A nonstick loaf pan, in case you feel compelled to whip up banana bread or a chocolate chip loaf. Get it from BuzzFeed's Tasty collection at Walmart for $10.74. 17. A set of geo design salad plates that will make your friends think you have way better style than you actually do. Smoke and mirrors, people! Whether you have an eye for design or you're trying to fake it 'til you make it, these plates are sure to impress whoever joins you for brunch. They come in an assortment of colors and designs that will brighten any table you set. Get a set of four from Walmart for $6.99. 18. Gold-band flute glasses, so you and your gang can feel fancy while sipping champs out of these. Pinkies up! These flutes look expensive but are actually super affordable. Encourage everyone to raise a glass in honor of your great taste and brunch-hosting skills. Get the set of four from Walmart for $28.38. 19. A 24-piece set of Pyrex storage containers that will guarantee you'll have more than enough ways to save leftovers. These glass containers are a blessing. They will hold all of your delicious leftovers from brunch and keep your cabinets organized! So adult. The set comes with a containers of all shapes and sizes and are both freezer- and microwave-safe. 20. And a gorgeous cake stand, because who wants to come to a gathering without cake? Let them eat cake! Wow your guests by displaying your desserts in this elegant cake stand. Get it from Walmart for $24.22. All that's left to do now is sit back and relax. Cheers!